DrinkWire is Liquor.com’s showcase for the best articles, recipes and reviews from the web’s top writers and bloggers. 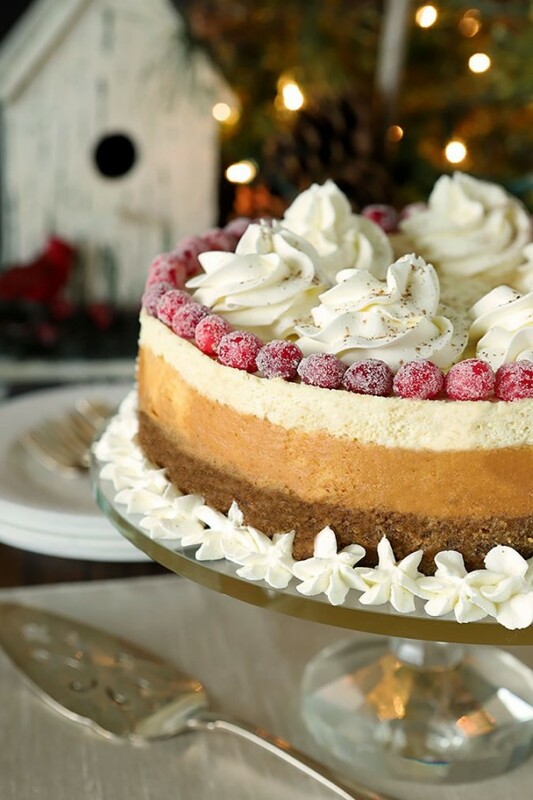 In this post, Creative Culinary offers a holiday cheesecake recipe. 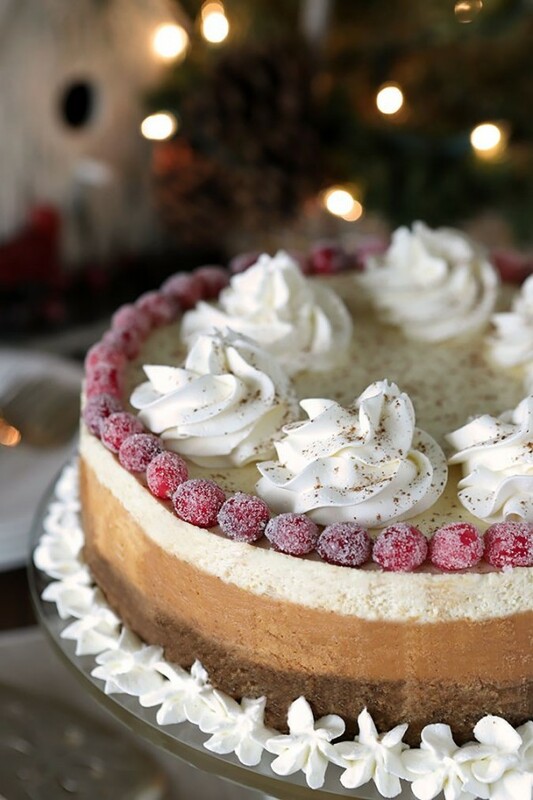 Make this Eggnog Cheesecake with Bourbon & Nutmeg on a Gingersnap Crust and both family and friends will love you forever! I am a pill about cheesecake. I like them simple. I want my cheesecakes to taste like a cheesecake, not a Snickers Bar or Oreo Cookies or any number of other derivations you can find today. I’ve made a couple that veer away from this a bit but still, adding some raspberry or cranberries is still preferable to me than making it a big candy bar. For the most part this Lemon Cheesecake has been my go to forever. It’s just so perfect. Lightly flavored but definitely lemony and just the perfect taste and texture. So when I decided to veer off course I certainly had to retain some of those elements I loved. Most specifically the topping that is added after the cheesecake bakes. I’m so used to having it be a part of the end result that I knew I needed to modify it to work with this recipe too. It’s not just the flavor boost either; nope. Truth be told, cheesecakes have a horrible tendency to split when baking. While many might try to circumvent this with a water bath, I much prefer to simply cover the top with a luscious topping. Easier and tastier wouldn’t you agree? My birthday was this past Sunday and I enjoy making something for myself. I started this on Saturday with the intent of finishing it up Sunday morning and inviting several neighbors over to celebrate with me. Lucky for me, one neighbor called before I had invited everyone and asked if I would like to visit her parents for lunch for my birthday. How quickly plans can change! Her mom and dad live a bit south of me and not only have the most gorgeous home but the view is breathtaking. Literally. Their deck overlooks nothing but pine and rock formations common in the foothills leading up to the Rocky Mountains with the mountains in the distance. The last time I was there, a deer and her fawns leisurely enjoyed some grass outside their floor to ceiling glass windows in the dining area and I was smitten. They are also great cooks so we enjoyed steak, potatoes, and pineapple from the grill, sauteed mushrooms, some gorgeous popovers, Brussels sprouts, and I had a crowd to enjoy this dessert. Perfect. I imagine I could try some superlative adjectives to convince you but seriously just look at it. It turned out so perfectly beautiful and the taste measured up to the visual. The crust is a combination of both graham cracker and gingersnap crumbs which happened because I was lacking enough of either and it was the perfect marriage. Not overpoweringly ginger at all, no, just right. The cheesecake is flavored with eggnog from a local dairy so I have to urge you to get equally good version for yours; it needs to be rich to do it’s magic and flavor this cheesecake. I’ve modified the topping I love on my lemon version to work on this one too, using a combination of sour cream, bourbon and eggnog; I had to be careful I didn’t just devour that with a spoon! Finishing it all off is bourbon whipped cream with a sprinkling of nutmeg. It will remind you of that first adult glass of eggnog you were served by mom and dad but with a light enough hand it’s not overpowering or restricted just to adults. Of course I decorated it with sugared cranberries (recipe in this post). It seems that I am unable to make a holiday dessert without them! I recently bought a new cheesecake pan; not to be confused with a springform pan. It’s not as wide as my springform so it made a beautiful tall cheesecake; just be sure to read the recipe notes if you use a similar size; it takes an extra step to fit everything in but it’s easy and so worth it. I love the cheesecake pan; even though I added some whipped cream garnish to the bottom of this cake it did exactly as I had hoped…the bottom of the pan is basically invisible; no more big thick metal springform…YAY!! Make this. You will not be disappointed! Here’s to the happiest of holidays! Spray the inside of the cheesecake pan or springform pan with non stick cooking spray. Line the bottom with parchment paper and spray again. Surround the bottom of the pan with double layers of foil and scrunch up to the rim of the pan (to prevent leaking). Combine graham cracker and gingerbread crumbs, sugar and butter. Press into bottom and 1/2" up sides of a springform pan. Bake at 350 degrees for 5 minutes. Let cool before adding filling. Beat the cream cheese in a large bowl or stand mixer on medium speed until smooth, scrape down the sides. Add the eggs one at a time, beating between each addition, scraping down the sides of the bowl as needed. Gradually add the eggnog and bourbon. Sift the confectioners' sugar, flour, and nutmeg together in a medium bowl, then fold it into the cream cheese mixture and pour the filling mixture into the prepared pan with crust. Bake for 45-60 minutes depending on the size of your pan (See Notes). Blend sour cream, eggnog, sugar and bourbon until smooth. Remove cake from oven. Gently spread sour cream over top of cake. Return to oven and bake for 12 additional minutes. Once cooled, remove from pan to serving plate and transfer to the fridge to chill for 8 hours or overnight for best results. Just before serving, whip the heavy cream, light brown sugar, and bourbon until stiff peaks form. Pipe whipped cream onto cheesecake and dust with ground nutmeg. I've made this in both 10" and 11" pans. It works for either, just a change in baking time is required and this one additional consideration if you are using the smaller 10" diameter pan. When I decided to make it in my new cheesecake pan that is 10" in diameter, it resulted in a cake that rose to the very top of the pan, without room for the topping I love. That topping is both a nice creamy addition but also, and this is huge, it's a great coverup for any cracks that might occur. So, if you use the smaller size, like I did? You have to wait until AFTER that full hour in the oven to do that step. The cheesecake will have fallen enough back into the pan to have room for the topping. Remove it from the oven and turn the oven back on to 350 degrees. Make the topping and smooth it over the top of the cheesecake. Once the oven is up to temp, bake for an additional 12-14 minutes until you can see it has set and the topping is no longer so shiny. Remove, cool and then refrigerate, finishing with the whipped cream and/or cranberries as indicated in the recipe. This is easier in my larger springform pan but I just love the taller result of the 9" pan so I thought the extra bit of effort totally worth it! 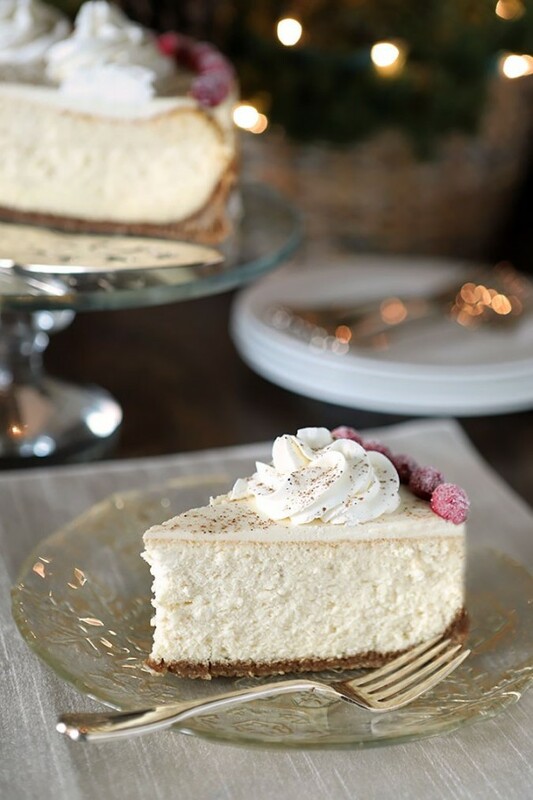 The post Eggnog Cheesecake with Bourbon and Nutmeg appeared first on Creative Culinary.